Is a lack of communication in marriage causing conflict in your relationship? Check out these four marriage communication skills that prevent fights. The funniest thing my husband and I have ever fought over was a laundry basket. Of course, it wasn’t actually the laundry basket that was the issue. I had an unexpressed expectation that my husband not leave his worn but not-ready-to-be-washed clothes on the floor, and I thought I was being helpful by purchasing a basket he could dump them in. He interpreted my action of buying a separate laundry basket as passively aggressively trying to parent him. In other words, we got into a pretty funny fight because of a breakdown in our marriage communication skills. If you’ve been married for more than a week, you’ve probably run into similar patterns. Every marriage has hot-button issues that set each person off. But in my observation, after ten years of marriage as well as mentoring several other couples, the real issue almost always comes down to the same thing: a lack of marriage communication skills. 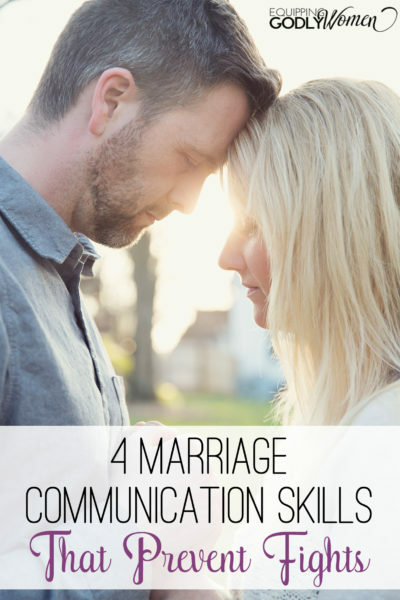 If you’re frustrated about the repeated fights you get into with your spouse, here are some four practical marriage communication skill that have strengthened our marriage through the years. Alright, now on to the tips! I recently asked some of my blog readers what they most frequently miscommunicated about in their marriages, and one that stuck out the most was scheduling. I remember this being really hard as a newlywed. We had two separate lives and all of a sudden they were not separate anymore. I couldn’t just wander around on a Sunday afternoon doing what pleased me; I had communicate and coordinate with my other half. We figured out our dynamic relatively quickly…and then came kids. Early in our marriage we got the advice to have a weekly one-on-one planning meeting. I highly recommend doing this if you’re constantly missing each other’s cues. It was a very helpful habit to learn early in our marriage. Now, we actually talk almost daily after we put the kids to bed. Weekly just wasn’t enough! Sidenote: it’s helpful if you’re also praying together during this time. I know a lot of couples use shared electronic calendars. This is a great system for many people, but for us, I find my paper planner is adequate as long as we are communicating about it (he prefers adding events to his electronic calendar). The important part is both of you writing your plans down. As trivial as it might be, talk to your spouse when something comes up so you can adjust your calendars accordingly. My husband and I text each other frequently and confirm changes. Note that these strategies don’t just apply to your schedule. With regular communication and a good planning system, you can also talk through your finances, parenting and whatever else you need to coordinate. Communication in our marriage starts to break down when one of us (ahem, usually me) has an expectation and the other falls short of it. I can’t tell you how many times my husband has pleaded with me because he simply could not read my mind! Often I have expectations that I am not even aware of. For us it was helpful to read some books together that help couples create a “needs vocabulary.” I personally recommend The 5 Love Languages and His Needs Her Needs, as well as checking out any marriage classes that your local church might offer. Talking about each other’s needs is also a great topic to discuss during the weekly planning times described above! Brittany also has some very handy marriage conversation cards that can be quite helpful—and fun! A good habit is to start your part in the conversation with the words “I feel…” and filling in the blank with words that describe you without placing judgment on the other person. You can also express what your personal needs are. This style of communication tends to diffuse anger rather than aggravate it! It also helps us to remember that feelings are feelings, regardless of what the other person intended. If your husband expresses that you have hurt him, apologize, regardless of the circumstances. From there, work together to identify how you can avoid repeating the offense in the future. This communication skill is something my husband and I were taught a couple of years ago, and wow has it been helpful. Every marriage has a different dynamic and most likely a repeated pattern that it gets into over and over. Think about it: how many times have you said to yourself, “I can’t believe we’re fighting about this again”? As bad as it feels, it’s totally normal to have repeated argument patterns. The key is to recognize them and nip them in the bud! Our regular pattern is the one I talked about above: I have an unexpressed expectation which my husband fails to meet, he gets angry, my feelings are hurt, and around and around we go. What we’ve learned to do is say, “I think we’re in our pattern,” and that helps us pause and identify what went wrong. We cool off and talk through our expectations, instead of getting into cyclical arguments that go nowhere. All in all, it’s impossible to have a perfect marriage, but with the right tools and communication skills, you can definitely have a healthy one. If you enjoyed this post, you might also like Why Couples REALLY Fight About Money or 6 Ways to Avoid Conflict in Your Marriage. What do you and you spouse fight about most often? Have you discovered and tricks to help you not fight as much?